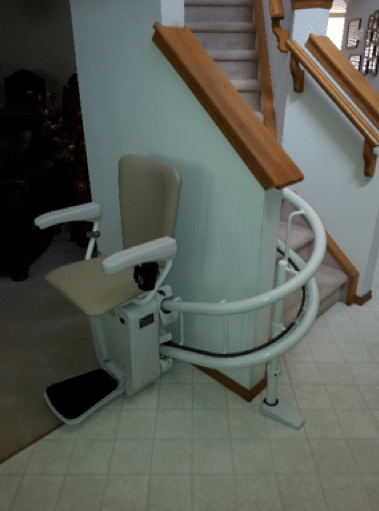 A stair lift, sometimes called a stair chair or chair lift, is a motorized chair that makes it safe and easy to access multiple floors in your home, completely eliminating the need to deal with steps. Stair lifts can be made to work with straight or curved staircases and can be adapted to suit your specific needs so you can continue your daily living routine and stay in your home longer. which side of the staircase should the rail be installed? is the staircase uninterrupted from bottom to top? is there a landing between sections of stairs? does the staircase have turns? is there a doorway or closet door? Advantage Home Health Solutions knows you deserve your independence and will provide you with the knowledge and understanding to ensure you can make an informed decision. We’ll let you know the options available to you and which will best meet your specific needs. Stair lifts from Advantage Home Health Solutions incorporate a variety of features to ensure you’re safe, confident and comfortable using them. Speed Governor: These ensure your stair lift doesn’t move too quickly, keeping you safely in your seat. This is especially important when descending the stairs, as the stair lift will never slip. Obstruction Sensors: These sensors stop the chair if any potential obstacles are in the way. Seat Belt: Seat belts help you avoid slipping and sliding in your seat and are especially important for someone who has issues with balance, or for a child. We always recommend using a seat belt when operating your stair lift. Constant Pressure Control: You must have your palm or finger on the toggle of the arm, or the stair lift won’t move. If you release the toggle, the stair lift stops. This ensures you only progress when you want to. Remote Handsets: Two remote control handsets come with every stair lift, making it ideal for people who need additional assistance or for two people so the stair lift can be remotely called to the other end of the stairs. Advantage Home Health Solutions also provides recycled stair lifts when they are available. Installing a recycled stair lift costs less money. We have many years of experience with stair lifts both new and used and age is seldom a factor. When a stair lift runs as smoothly as a new one, and if the rail is in great condition (no telltale signs of wear), it is worthy of consideration. But What About a Warranty on Recycled Stair Lifts? Advantage Home Health Solutions provides a full 90 day warranty on all recycled stair lifts we sell. Even if a stair lift is in excellent condition, we never buy it back or sell it unless we have complete access to the original manufacturers technical support and parts department. All recycled stair lifts are thoroughly inspected and refurbished appropriately before we offer them back to you. We always let you know if there’s an option to save money by buying used but we will never compromise your safety. In you’re in search of a stair lift with the narrowest profile and a full manufacturers warranty, then a new stair lift might suit you better. We’ll help you decide if that’s the better option. Advantage Home Health Solutions doesn’t charge you for time on any issues relating to warranty in the first year. For additional information on our stair lifts, and purchase options, please fill out our contact form and get a FREE consultation today. We’ll provide you with all the information you need to make an informed decision so you have the best solution and complete access to your home.